It isn't very often that a really practical but equally cute products comes along. In fact the idea behind my today's top treat is so simple that it is hard to believe that someone didn't come up with the idea before! Sleepytot is a soft and cuddly baby comforter that has velcro pads on it's hands and feet that you can attach a dummy, or teething ring to. Yes, so what you might say...... Think about it. How many times have you checked on your baby only to realise that their dummy has fallen out of their cot and into a dust ball behind the wardrobe? If you are anything like me the answer to that is many, many times! No matter how well I clean it is just a true fact of life that your nice clean dummy will find a nice grubby pile of muck to land in! 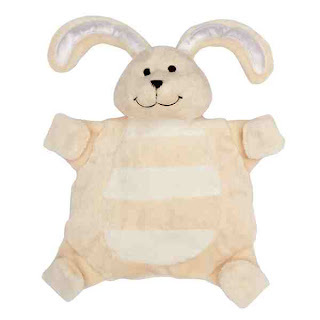 Apart from keeping stuff from straying, Sleepytot is a cute and cuddly friend for your little one to snuggle up to at night - and replaceable should he be lost. Not just for babies either. My middle daughter is bunny mad - as you know from previous posts and she just loves her Sleepytot!